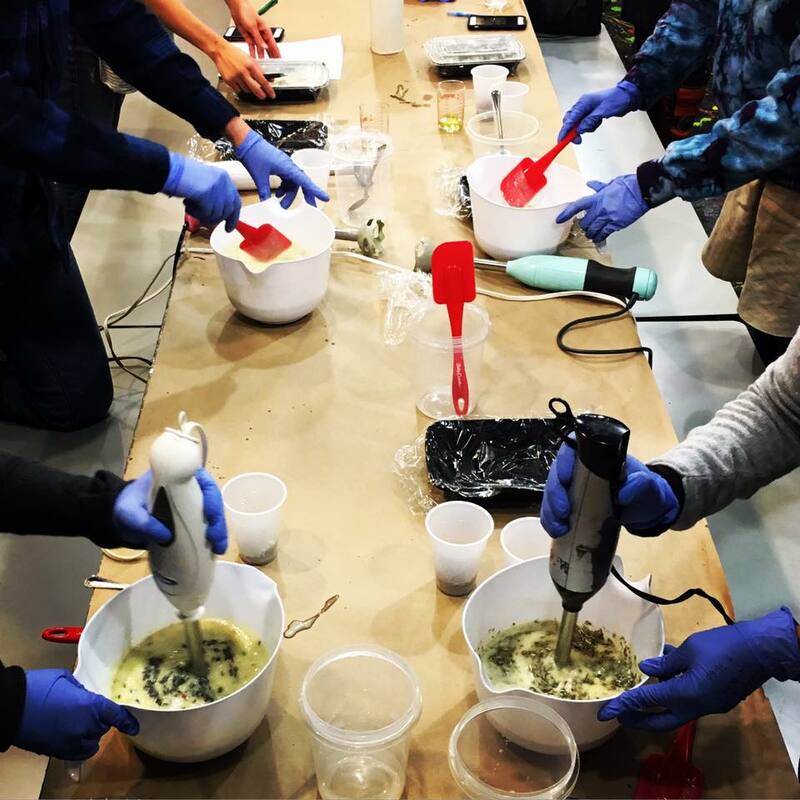 This is a 3-hour, hands-on, immersive soapmaking workshop offered master soapmaker, Marla Bosworth. In this class students will learn how to use plants and other organic, natural ingredients to make soap from scratch using the cold process method. Each student will design and create their own batch of soap to take home (which equates to eight bars when cut). What in nature inspires you? What can you share through a beautifully designed botancial soap to inspire others? It might be locally grown produce or honey from the farmer's market, wildcrafted elements from a nature hike or water from a river or stream. This is just a sampling from where we can source our inspiration. What makes this class special? With Marla's guidance, you will create your very own batch of soap by selecting botancials, colorants and making very own essential oil blend. Marla is keeping this class small to work side-by-side with you. You'll also have the pleasure of meeting other interesting and likeminded people. Student will receive hands-on experience, an information-packed class handout with instructions, recipes and valuable supplier list and of course get to take home a custom batch. How to work with lye safely (you're going to measure and mix your own), how to formulate a great soap recipe, where to buy supplies and everything "cold process" that you want to know! Each student will bring out their inner alchemist by making their own batch of soap from scratch. You'll select wildcrafted botanicals as well as create your own essential oil blend. Marla creates high experential workshops - a holistic perspective of learning by transforming new information. If you've ever attended any of her classes you know the energy she creates is positive, supportive, educational and fun. Bio: Marla is the CEO of Back Porch Soap Company. She has been making green beauty products and soap for 21 years. She is an intuitive, empath and medicine woman working with shamanic and multidimensional healing modalities. She resides in the Grand Tetons of Jackson Hole, Wyoming. Marla will share with you what she has been doing for a lifetime as an alchemist. It began when she was a child in central Illinois and would create infusions with botanicals found walking in the woods, forgaging in fields or in her parents garden. Later in life when she created her botanical beauty company she began creating soaps in Massachusetts and captured the energy of the Atlantic ocean and Cape Cod in her bodycare line. Then she moved onto Jackson Hole, Wyoming where she worked with the energy of wild animals, the Rocky Mountains and the plethora of botanicals growing in the valley. Customers would come into her store and tell her how her products envoked memories of hiking on trails in Yellowstone or Grand Teton National Park. They would hold the soap - some knowing and others not - that the vibrational frequency in the soap brought memories and oftentimes emotional healing. Course Fee: $168 Early Bird Special through April 19. Regular rate of $188 thereafer. Fee includes workshop, materials, supplies, ingredients and a valuable handout with recipes, formulation tips, instructions and a list of our favorite suppliers. Note: All classes must be prepaid in full. Due to venue rental contracts and Marla's travel and accommodation commitments, we do not offer refunds nor credits on classes missed. If you would like to send someone in your place, please let us know 24 hours prior to class.